IMPACT Event Calendar mobile application featuring a list of upcoming events with event details brings you greater convenience and a modern service enabling you to keep track with your lifestyle. 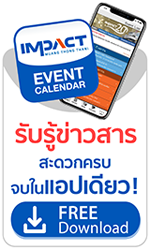 With IMPACT Event Calendar application, you can conveniently access information about current and upcoming events happening at IMPACT Muang Thong Thani i.e. date, time, location, ticket information and organizer details; plus the latest feature of our Event Calendar application will direct visitors to the event organizers within the app. In addition, Google Maps with directions to an event and buildings map destination instantly! You can also find promotions from IMPACT’s restaurants and event showing locations of buildings in the entire IMPACT Muang Thong Thani compound are also available to help you plan your route and simplify your commute. Moreover, the application also features live traffic reports which keep you updated with the current traffic conditions and suggestions for alternate routes as well as Parking Map showing where to park, capacity and fee details. Last but not least, you can easily share event information with friends via email and social media from/within the app. 1. English and Thai languages supported. 2. Event List view displaying the sorted list of current and upcoming events. 3. Calendar view providing information of events in particular months for easy planning. 4. Event Details view providing additional event information i.e. event agenda, date, time, ticket information, map and etc. 7. Promotions view listing special deals and promotions of restaurants in Muang Thong Thani and event organizers. - Directions to Event, navigating you to your designated event. - Google Map / Apple Map giving directions from your current location to IMPACT Muang Thong Thani. - Buildings Map locating the exact buildings and rooms of each event. 9. Information easily shared via social networking platform allowing friends to receive current updates and news. 10. Add your favorite events to the device calendar. 11. Follow IMPACT on Facebook and Instagram. 12. Live Traffic Report providing real-time information on the current traffic conditions and suggestions on alternate routes to avoid the traffic. 13. Parking Map shows parking, capacity, and fee details as well as one-tap away from getting direction. 14. Transportation shows available public transportation and navigates to parking spots.